The breadth and scope of the various possibilities within the expansive landscape of one modern political assassination are vast. The legal record consists of thousands of pieces of relevant evidence, hundreds of witnesses, dozens of incompetent actions, manipulative official suppressions, and one alleged official suspect. Yet there remains tens of thousands of pieces relevant evidence uninspected or denied to most past official investigations. Hundreds of unquestioned eyewitness and dozens of possible leads were allowed to fade into history. The single fact is that answers remain not just buried in the modern information denied but among the millions of files publicly available for some time. Two President's Commission witnesses observed a large man carrying a rifle in a rifle sack as they passed him in downtown Dallas but officials never identify this person. Others claim a large man privately threatened the life of President Kennedy months earlier due to his loss of lucrative business proposal. The Federal Bureau of Investigation briefly investigates and dismisses any connection to the events of November 22, 1963. Yet this man was present and unaccounted for by officials in some of the most critical moments of the official timeline. John Henry Hill was born May 9, 1928 in Florida to John R. Hill and Anna C. Hill. By 1940, the Hill family had relocated to Texas according to official records and he lived with his parents, older sister Anna Ray, his uncle Marvin Weakley, and a lodger named Thomas Grose.i John Hill attended primary school, went to Woodrow Wilson High School in Dallas, was a Cadet Staff Sergeant for the local ROTC where he would have likely received years of basic rifle training. He also was a member of the Junior Bar Association, the Dallas Historical Society, and joined the High School branch of the Young Men's Christian Association. Hill would subsequently rise from his more humble beginnings to a successful future entrepreneur in commodities. "Hill stated that after the Kennedy administration began to put its civil rights and integration program into effect, he began to discontinue his support of the President because he disagreed with these programs." He also states having no personal animosity toward the President and that he made millions during the Kennedy tenure. Indeed, Hill generated millions but he also suffered the loss of a lucrative future business arrangement due at least in his mind to the Kennedy administration. Hill was a member of an investment group that planned to acquire the complete oil rights of Pan American Oil Company in the State of Texas. After doing so, they would reorganize the company and then offer profitable fuel contracts to the City of El Paso but as Hill attempted to complete the business arrangement, he states the group was "...thwarted by the complicated procedures of the Federal Power Commission in the Kennedy administration." It appears that disagreements over domestic policies and at least one blocked finance deal soured Hill's former image of John. F. Kennedy. Hill could not recall being in a group where he made remarks against the safety of the President. Roger Tittle was the President of the Panhandle Steel Company located in Texas, a political associate of Lyndon Johnson, and one of his business associates was John Hill. According to him eight months to a year preceding the assassination Tittle and his wife accompanied the Hills to a dinner engagement at the Cipango Club. He advised that over drinks and dinner "...Hill began a very vicious verbal attack on President Kennedy personally. He stated Hill criticized what the President was doing to the country and blamed him for bringing Communists and Socialists into the Government" and Hill was incensed that Edward Kennedy was running for election as well. 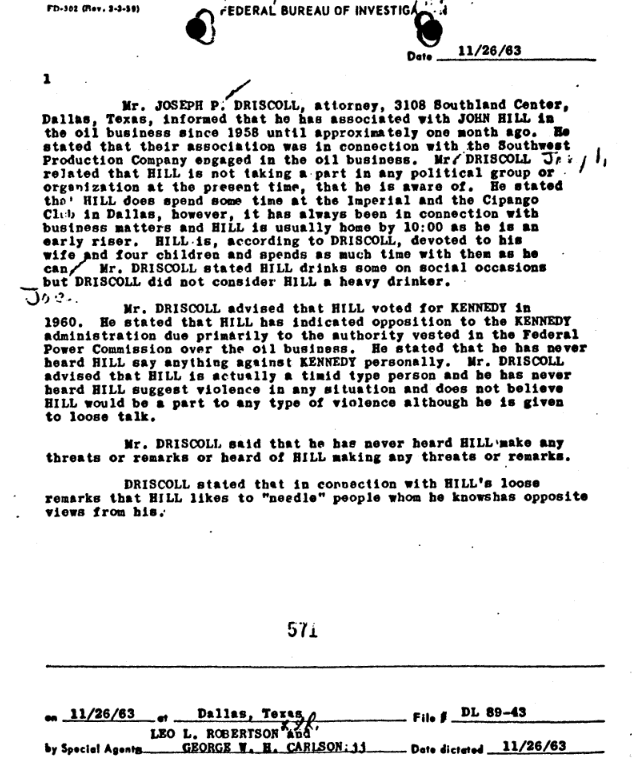 Tittle additionally alleges that Hill complained of Kennedy stating oil prices were too high, and threatened if Tittle did not do something to correct these problems Hill knew oilmen who could assassinate the President. The tirade was reportedly so upsetting that Mrs. Tittle left the table in tears and Mrs. Hill followed her. Hill states he could not help upsetting Mrs. Tittle but insists he was not kidding around and the Tittles insist he was not drunk. Oscar S. Wyatt was the Chairman of the Board of Coastal States Gas Products Company described himself as a friend of President Lyndon Johnson and prior acquaintance of former President Kennedy. He recounts that both John Henry Hill and himself contributed to and supported the 1960 Kennedy campaign. 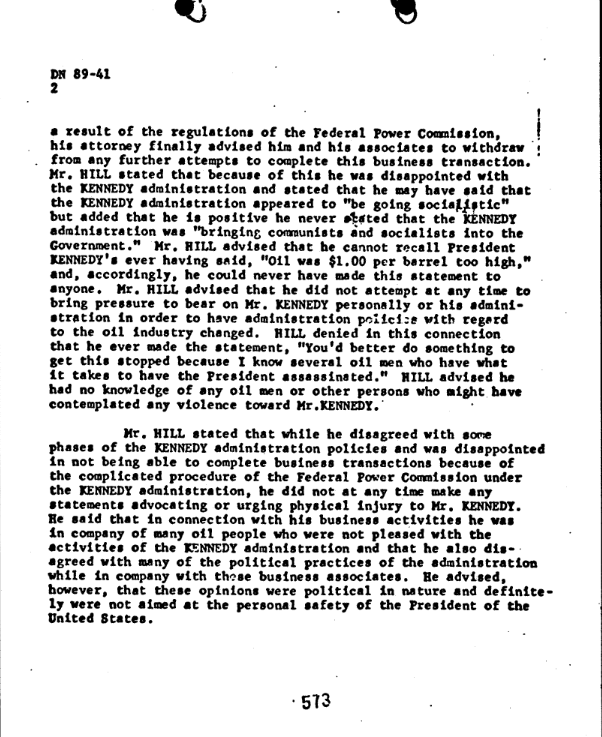 Wyatt believed since his oil interests were in conjunction with the Kennedy family's interests and that he or Hill would have notified the Kennedy family of any threats made.v This of course does not explain why Hill would have reported his own alleged threats, and ignores his significant break with President Kennedy and his policies. Joseph P. Driscoll was John Henry Hill's former business partner, and President Kennedy's former college roommate. John Hill according to Driscoll was not involved in any political group or organization currently; he adds that Hill frequents the Cipango and Imperial clubs in Dallas. He states Hill is an early riser and is usually home by 10pm and that Hill drink socially but not heavily. Driscoll supports Hill strongly opposed Kennedy's domestic policies and the authority of the Federal Power Commission over the oil industry. Driscoll states he never heard Hill threaten the President and did not believe he would be a part of violence against Kennedy, but noted Hill is "given to loose talk. "vi Hill sold off all his interests in Southwest Production Company in October of 1963 and ended his longstanding business partnership. The FBI questioned Mrs. Jo Beth Hill following the President's assassination while she and her husband were on a hunting vacation at Vermejo Park Ranch in New Mexico. After informing her of her rights, the FBI accepted her statement and notified her of the allegations regarding her husband. 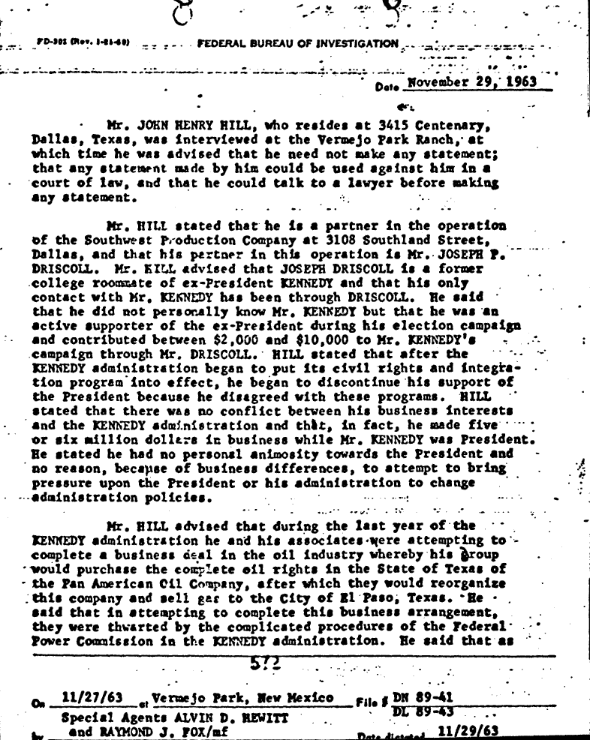 Mrs. Hill denies that her husband made critical remarks directed at President Kennedy regarding Communists, Socialists, the price of oil, and making a direct threat to President Kennedy. She cannot recall that her husband made violent statements about President Kennedy but that she and her husband disagreed with the Kennedy administration concerning racial integration. The Hill's personally felt the Kennedy administration was moving too fast, she also confirms that Hill in the past donated to the Kennedy campaign and they were invited to the Kennedy Inaugural, which they could not attend for health reasons. Mrs. Hill continues stating that she and Mr. Hill were in Dallas on the morning of November 22, 1963 and they were both finalizing their purchases for a planned hunting vacation. In the morning, Mrs. Hill reports she went to the Neiman Marcus store at 1618 Main Street to have some jewelry repaired and claims to have left Neiman Marcus shortly before noon and proceeded to meet her husband at the Cullom and Boren Sporting Goods store at 1509 Elm Street. Mr. Hill was completing the purchase of clothing, ammunition, and supplies for their upcoming hunting trip. Among his purchases is a likely pre-calibrated new rifle with a positioned scope and this rifle was feasibly in a case because most people would not walk around town openly brandishing a rifle. 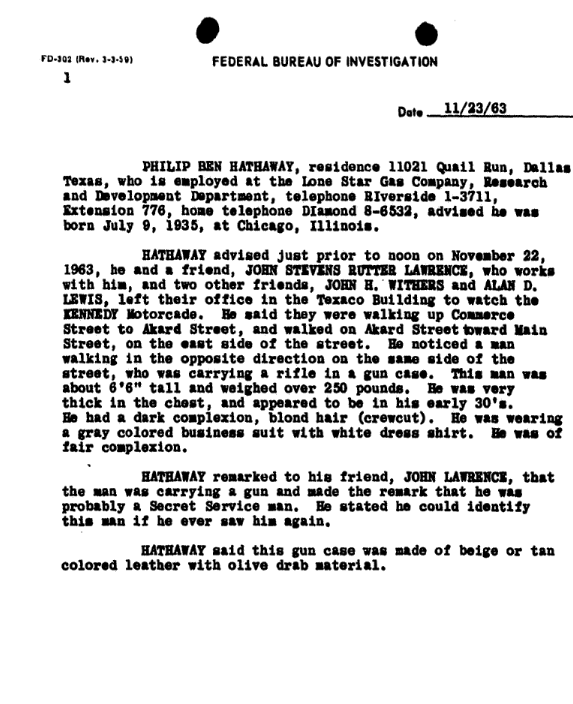 Official witness John Lawrence corroborates Hathaway's description of the man carrying the rifle case stating he was "...about 6'5 tall, and weighed about 250 pounds or more. He appeared to be a professional football player type and very muscular. He had dirty blond hair and wore it in a short crew cut. This man was in his 30's and was wearing a light colored business suit and white business shirt." Yet unlike Mrs. Hill and Philip Hathaway, he does not give a vague statement of the time. Lawrence states observing the man at 11:45 am, and thus Mrs. Hill left Neiman Marcus notably earlier than offered.xii None of the witnesses observes a young woman with the large man. John Henry Hill according to the related FBI statements and a previous photograph is 6'6 tall, 280 lbs, has blonde hair, purchased a rifle shortly earlier, and just happened to be headed to the Imperial Club within the Baker Hotel at the corner of Commerce and Akard Street during the same time multiple witnesses feasibly observed him. Neither Hill nor his wife is spotted overburdened with packages from Cullom and Boren; it is likely she drove their car to the Baker Hotel. 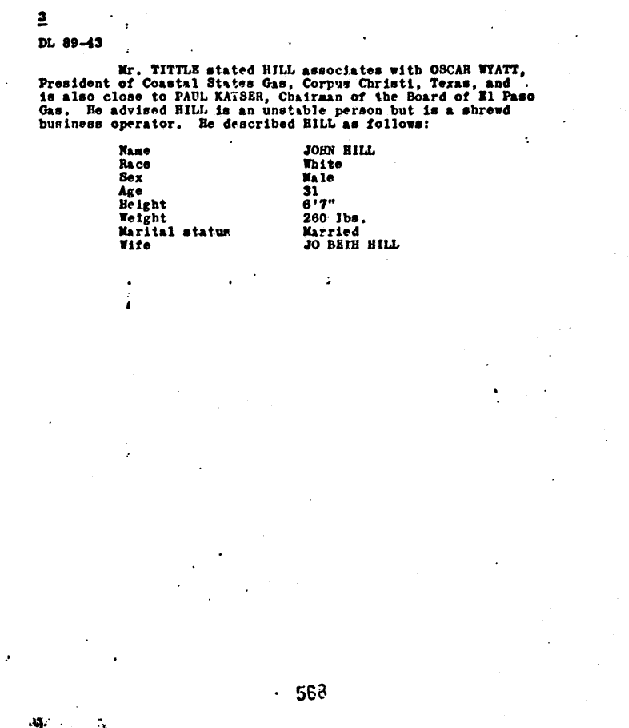 Hill decided to take the unidentified rifle with him to lunch and Mrs. Hill never mentions the rifle as they arrive at the Hotel and begin lunch around ten minutes before noon. Lunch concludes and Mrs. Hill proceeds down the street just over a block to Neiman Marcus. She picks up her jewelry and stays inside the store until 1 pm. While leaving she observed a report of the assassination on a television in Neiman Marcus. John Hill is elsewhere and unobserved for a period by his wife, there is yet no definite evidence of what he did until she later returned to him after 1pm. John Henry Hill I would contend is the formerly unidentified man observed by multiple witnesses. The FBI prior left the large man with a rifle unidentified in the periphery of the case. Additionally, John Hill represents an unknown person, with a feasible motive, a weapon, and had lunch approximately five blocks from Dealey Plaza before the assassination. He feasibly had time and substantial funds that present other possibilities as well. At the very least, he represents a previously notable figure overlooked by most officials and Hill's existence supports the possibility of other verifiable armed figures lurking within additional evidence. Consider that he could be a possible suspect or provided means to an unknown person and his discovery challenges the official claim that no other individuals present could have the ability to influence the events of that pivotal day. JFK Assassination Special: A Suspect named Hill?